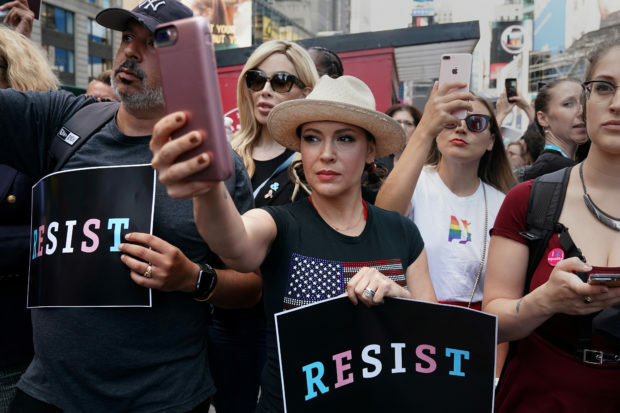 Actress Alyssa Milano posted a video on Sunday that offered a question-and-answer session, pulled from her own Twitter account, about the dos and don’ts of voting in the November 6th midterm election. Although Milano is a frequent — and very vocal — critic of the Trump administration, her short Twitter video breaks down some frequently-asked questions in a simple, concise and non-partisan manner. “Can I wear sweats when I vote?” was answered with a smile and the assertion that what you’re doing when you vote is more important than what you wear. Milano also added a caveat about wearing political t-shirts or buttons, warning that clothing interpreted as “electioneering” could bar you from voting. Milano offered tips on what to do if you are turned away (ask for a provisional ballot) and how to handle questions if you’re uncomfortable telling others who you voted for on Election Day. The video was a sharp departure from Milano’s tweets on Saturday, which blamed the Republican Party for everything that was wrong in the United States. And we’re the only ones who can stop it.